Our teachers strive to facilitate each individual’s cognitive, social, physical, and moral development. What Sets Us Apart From Most Montessori Schools in Barrington? MSNH is a true international environment where our children learn the importance of living and co-existing in this world culture. With our curriculums, our children’s’ natural gifts are identified and then enhanced. They learn to be independent, compassionate and make intelligent decisions while learning contribution, first here, then at home and in society. We maintain classroom environments where each child receives the personal attention they need to develop their individual gifts. We help them to expand their minds culturally, academically and socially so that they attain the life skills needed to achieve their goals and live life to its fullest. The emphasis of our methods here at MSNH is to create academically advanced children who can think creatively starting at pre school and continue from k-12. As we track our graduated students through their adult lives, we find them achieving their passions in life. Many of them are doing what they set out to do in life and have gone on to become composers, doctors, lawyers, accountants, opera singers, actresses, teachers and as many other fields as diverse as our children are. In 1999 we were honored by the American Montessori Society in becoming the 42nd Montessori School in the United States and one of the few accredited schools near Barrington. We have been serving Barrington IL and the surrounding communities for 20 years now and we are conveniently located just north of I-90 between Barrington Rd and Ela Rd. Please call us at (847)705-1234 to arrange a tour of our day school so you can see for yourself why we’re one of the most referred private Montessori schools/preschools near Barrington. Or complete our online inquiry form and a member of our staff will contact you. To learn more about Our School Programs Barrington please click the corresponding link to an area of interest. Our infant program (3 to 18 months) follows the individual child’s schedule with a flexible sequence of daily routines and activities. A strong partnership between home and school is a key element. In an atmosphere of unconditional love and acceptance, the development of basic trust is fostered. As infants communicate their needs, adults listen and respond appropriately. In addition to holding and rocking infants, we also engage them using expressive language. In a nurturing and secure environment, we care for their physical needs and provide for their developing personalities. Independence is fostered as infants learn to participate in their daily routine of care and practical life activities. Infants are provided with a variety of things to look at, explore and experience. Appropriate concrete materials create just the right amount of challenge for developing hands. They gain knowledge of themselves and their environment as we offer materials to meet their developmental stages and sensitive periods. Comprehensive language skills are developed through the use of materials, conversation, reading, and singing. Our Young Toddler and Toddler Programs (ages 18 months to 3 years) help children gain an appreciation for the joy of learning and for their expanding capabilities. Their strong sense of autonomy is encouraged as they begin to function more independently and explore a broader spectrum of activities. At this age, children are able to interact and work alongside adults, and they form real relationships with friends. This leads to the development of a true sense of community. Our Toddler programs encompass a daily routine with flexibility for individual choices. Toddlers do not merely explore, but are able to work and thus gain the ability to stay focused on a task. 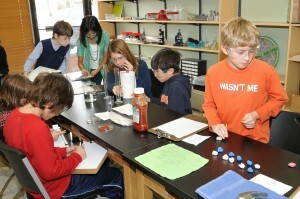 Practical life activities such as pouring, dusting, and setting the table are set up to help deepen this concentration. Equipment and materials are toddler-sized to promote independence. Our toddlers are given a variety of choices to support their development and interests. They are introduced to a work cycle in which they choose a work material, finish the work, and return the material to its place. Age-appropriate Montessori materials provide academic stimuli and promote cognitive preparation for more advanced materials used in the Primary Program. There is a focus on practical life, sensorial, beginning language, mathematics, and art materials. Our toddlers are exposed to a broad range of hands-on experiences, and our prepared environment entices toddlers to explore and discover. Group activities include stories, music, and movement. The daily routine includes snack time and outdoor or indoor gym time. Children do not need to be toilet-trained prior to entering these programs, but toilet-training is incorporated into the Program with parents’ help at the appropriate time. Children are required to be toilet-trained prior to moving up to the Primary Program. The focus of the Primary Program (ages 3-6) is to provide each child with an education for life and to polish the basic skills necessary for lifelong learning. Introduce the richness of different cultures and expand the knowledge of history and humankind’s place in the universe. The Primary classroom is divided into the areas of practical life, sensorial, math, language, geography, science, and art. Classroom materials are arranged on shelves in an orderly, sequential manner and are available for individual use. We offer a Montessori Elementary Program for the first through sixth grades. The Elementary Program has one lower elementary classroom (1st through 3rd grade) and two combined lower and upper elementary classrooms (1st through 6th grade). 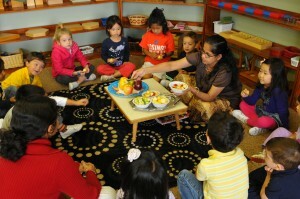 Each class is taught by a certified Montessori Elementary teacher and one or more highly qualified assistant teachers. At age six, the child moves to what Maria Montessori called the Second Plane of Development which encompasses children 6 to 12 years-old. There are enormous changes in the needs of the child from those of the First Plane (the years from birth to six years). The child is no longer centered around herself and her family but now has a great need to explore society and the world. If the First Plane is the age of “what,” this Second Plane is the age of “why, where, who, when, and how”. In the Montessori elementary classroom, we give the child the history of the universe, the world, the coming of plants and animals, and the emergence of humans on Earth and their contribution to language, culture, arts, mathematics and science. This is also the age when the child develops a moral sense, learning what is right and wrong. He strives to find how he can play an important and meaningful role in life. Elementary students learn about moral values through the study of virtues and various aspects of community building. Every three years the Upper Elementary students take an international trip to Costa Rica and work with local Montessori children there to learn about the rainforest and Costa Rica’s reforestation program. Our school participates in a Japanese Exchange program. Every few years, we host several students from Japan in our Upper Elementary classrooms. Our elementary students are also involved in outreach and humanitarian programs that benefit children from underdeveloped nations. Our sixth grade students have visited the United Nations in New York along with other Montessori students from around the nation. There they met with UN dignitaries and functioned as youth ambassadors for the various humanitarian programs of the UN. We also try to bring the world into the classroom by inviting guest speakers, musical ensembles, artists, and local people of interest. Elementary children are given opportunities to work together or alone to pursue individual or group interests. Their teachers facilitate creativity, independent thinking, and personal responsibility through practical life exercises in the classroom. The students prepare their meals twice a week and are fully responsible for taking care of their classroom and its materials. Mastery of Fundamental Skills & Basic Core Knowledge – Students explore the realm of mathematics, science and technology, mythology, literature, history, world geography, civics, economics, anthropology, and the basic organization of human societies. Studies cover the basics found in traditional curricula such as the memorization of math facts and spelling lessons. Considerable time is also devoted to the study of vocabulary, grammar, sentence analysis, creative and expository writing, and library research skills. Dr. Maria Montessori’s Great Lessons – The Great Lessons are five key areas of interconnected studies presented to all elementary students in the form of inspiring stories, related experiences, and research projects. The Great Lessons—intended to give children a “cosmic” perspective of the Earth—include the story of how the world came to be; the development of life on Earth; the story of humankind; the development of language and writing; and the development of mathematics. The lessons, studies, and projects surrounding each of the Great Lessons normally span many months and the questions that children pose and their efforts to find the answers to their own questions may continue for many years. Individually Chosen Research – Elementary students are encouraged to explore topics that capture their imagination. We encourage students to do a great deal of independent reading through both library and internet research. The information is then shared with their classmates on a regular basis. Their oral presentations and written reports grow in sophistication and complexity over the years. Every year our elementary students select a topic to research in detail and present it to an audience on Presentation Nights. The presentation includes oral and written reports as well as visuals consisting of a presentation board and other related items. We adhere to the Montessori curriculum but we feel we must also reflect American standards of performance so that when our students leave for other schools they will be secure in their new environments. To ensure this, we administer standardized tests to the children every year and teach them test taking skills and strategies that they will need in the future. To offer time for reflection, to ponder their lives and their immediate and future goals. Our program is dedicated to being individualized. Children receive presentations in small groups and teachers account for varied learning styles. In giving lessons and assignments, teachers cater to all learning styles, interests and strengths/weaknesses of the children when developing their goals and objectives for each area of study. Children are given an element of choice with respect to their assignments as well as their presentation of the material. No matter what the child’s learning style, areas of interest, strengths or weaknesses, the teacher aims to uphold Montessori’s element of choice throughout learning so as to engage the child to enhance their learning experience through the development of in-depth knowledge, rather than fact processing or memorization. Parents are encouraged to come for observations. Because of the sensitivity of children throughout adolescence, we encourage parents to come in before or after school to look through their children’s albums (which are a collection of pictures and work) for each subject area. We also have our monthly parent/student Morals and Ethics meeting, where parents can hear their child’s perspective on various issues as well as share their own. We do not see our classes as individual units, rather more an extension between curriculum areas. Within each subject we aim to tie together concepts of other subjects via the utilization of the “Great Ideas of the Western World,” the “52 Virtues,” and the moral and ethical implications throughout history. In accordance with the Montessori philosophy, we continue the tradition of the three period lesson in the Erdkinder environment. The first period lesson involves the didactic presentation/sensorial experience; the second period involves research, papers, readings, art etc. ; and the third period is the proof of knowledge acquisition which can take many forms. Children may have a written/oral exam or a dramatic performance as a part of the third period of a lesson. Our program is a three year program. Within our framework for learning, there are courses that are three year courses, as well as courses that are year long. Three year courses are designed to grow in complexity over the three years of the student’s involvement in the Erdkinder program. English Grammar Structure and Writing – The aims of this course are to sharpen both the grammar skills as well as the writing skills of the students. As a part of this course students are exposed to the Arco word list, where they explore a variety of ways to expand their vocabulary. The curriculum also covers grammar skills and word usage. Students work with parsing words in paragraphs or reverse parsing, sentence diagramming, grammar work sheets, etc. Significant work also deals with proofreading and editing. For the writing portion of this course, students engage in topics across all curriculum areas where they utilize the 18 types of fiction and nonfiction. Erdkinder Morals and Ethics (EME) – The aims of this course are self-awareness and human awareness, including developing a love for service and engaging in meaningful discussion about ethical issues throughout our world. This course begins with psychology. Through the understanding of what motivates people as individuals and an understanding of their own self-motivation, students understand the impact of their contributions to society. In conjunction with this course, students are involved with numerous community service projects, both within the school as well as outside of the school community. In school, students serve as assistants in the Primary (age 3-6) classrooms. Outside of our school community, they work with local outreach programs such as the Elgin outreach program, Hoffman Estates Adopt a Park Program and Alden Senior Center. Creative Expression – Our program includes a variety of forms of creative expression. Art instruction includes drawing/form, pastels, clay, ice sculpting, photography, mosaics, painting, structural design, dance, flower arranging, painting, music and drama. Various types of music are also offered, including acoustic guitar, electric guitar, and keyboard piano with varied tempos and beats. Once they have a good grasp of melody and tune, students are encouraged to create their own compilations. Physical Education – As children reach adolescence, their internal clocks tend to shift causing them to feel less alert in the morning; for this reason children begin each day with half an hour of physical education. The emphasis of the program is strength, flexibility and cardiovascular training. A variety of team games and individual activities are incorporated. World Language – We currently offer both Spanish and Japanese language instruction. Spanish is a full immersion language class. The children work on the foundations of language, verb conjugations and sentence structure. Japanese utilizes both English and Japanese, working mainly on vocabulary and sentence structure. Typing/Computer Skills – As technology has become such an integral part of our society, technology presentations are given with associated follow-up assignments. Children are expected to use the Microsoft Office suite of products for their work across all curriculum areas, and typing skills are reinforced using the Mavis Beacon typing system. Microeconomics – An integral part of the Erdkinder program is the Microeconomics program which serves as a link between subjects while also providing meaningful adult-like real work which engages the adolescent and gives him/her a sense of purpose. Apprenticeships are rotated on 6-week cycles. These apprenticeships serve as small businesses, where students produce and sell goods. It is through this process that the children learn the value of money, as well as profit and loss, supply and demand and the cost of labor. Among the apprenticeships offered are a café, sewing, and gardening. Subjects such as finance, history, chemistry, and mathematics are incorporated into the instruction of each apprenticeship. History – The history curriculum includes the history of the United States and the United States government; the spread of civilizations throughout Europe; and the spread of civilizations across Africa, Asia, Oceana, and the Americas. Each topic is presented as a year-long course on a rotating basis. The goal is to instill a sense of appreciation for the development of civilizations and a sense of humility for the part an individual plays in the greater scheme of life. This course always begins with a presentation on the timeline of civilizations so that the children have a visual framework for each area of concentration. Mathematics – The math curriculum begins with an introduction to the timeline of mathematics. The first year of the cycle begins with a review of pre-algebra and advances to algebra I. The second year of the cycle, students continue with more advanced algebra skills and begin work with geometry. Banking and economics are also covered to reinforce lessons in microeconomics. The children also work on word problems, which help them in language and develops abstract reasoning skills. The third year of the mathematics course involves algebra II and pre-calculus. Literature – The aims of this course are to attain a sense of appreciation for great literature, to be able to analyze literature for its time period and influences and to compare and contrast various forms of literature. The course begins with the development of language and written expression throughout the world. The literature curriculum parallels the history curriculum in that the children study the literature associated with the history of specified geographic areas and time periods. The first year of literature covers American Literature, the second year of the cycle covers European Literature and the third year of the cycle covers African, Asian, Australian, and North/South American literature. Science – The science course is done on a three year rotation. One year of the science rotation is physical science (physics and chemistry); one year of the rotation involves the study of Life Sciences; and one year of the rotation focuses on Earth Science. Children may engage in meaningful work within the sciences as an integral part of the curriculum. For instance, gardening is incorporated into the study of geology and the elements of the soil so students can experience better outcomes in the garden as a result of understanding the science behind it. The school offers a nine week summer camp divided into three 3-week sessions. All children, especially siblings and former students, are welcome to attend. Summer camp participation can be an excellent introduction to our full-year programs. At the Toddler and Primary levels, children have the opportunity to work in a Montessori environment. Our Elementary level students participate in activities centered around a “summer” theme. Cooking, baking, arts and crafts, research projects, and creative writing are among the activities offered. Swimming lessons are also offered at a nearby pool twice a week. Frequent additions to our program include age-appropriate music, sports, yoga or Jazzercise. Sessions include educational field trips and in-house artistic performances. Our traditional celebration of the Fourth of July includes a neighborhood parade and a picnic lunch. The dates of our Summer Sessions vary slightly from year to year. Please see our School Calendar for important dates regarding the upcoming Summer Session. ©2019 Montessori Schools. All Rights Reserved.